As part of our bedtime routine, we try to read a couple stories out of the Bible. 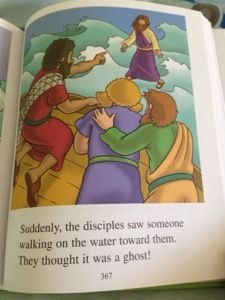 Last night we read the story where Jesus walks on the water to His disciples. How many times have I read this story? A lot. But something struck me this time. Picture this: twelve grown men, burly, bearded, sun weathered. Fishermen. Men who worked hard, day in and day out, with rough, calloused hands. A zealot, or fighter. A tax collector, who, before knowing Jesus, probably knew the ins and outs of intimidation and manipulation. Tough guys. Twelve men in a boat, and suddenly a storm comes up. Now, we know at least four of these men practically lived on this sea. All of them were acquainted with being in boats, even during a storm. And yet, they were having trouble. As they fight the storm, they look out, wind whipping their faces, water spraying into their eyes, nose, mouth, and they see a figure coming toward them. He is walking toward them, feet and body unaffected by the winds. His hair probably whips around, but His face is steady. He knows His destination, and He is undeterred by the storm. The disciples are in the middle of a life threatening storm, but – get this – they were afraid of Jesus. They thought He was a ghost. As He came toward them, these twelve men were terrified. Jesus, ever calm in the storm, reassures them, but they don’t believe. They believe more in the impossibility of the circumstance than in Jesus’ ability. Now comes a part I find equally absurd and fascinating. 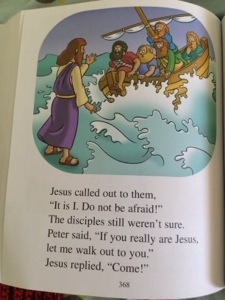 Peter asks Jesus to prove Himself by allowing Peter to walk on the water. As a fisherman, Peter knows the danger of the storm, but he’s willing to step into it if it means he will reach Jesus faster. It seems that Peter counted braving the storm and possibly encountering a ghost as the lesser evils than staying in the boat without a Savior. But what about the other disciples? Even having seen multiple miracles from Jesus in days leading up to this, the other disciples still couldn’t believe the availability of the miraculous in their everyday lives. When Jesus reassured them He was not a ghost, only Peter was willing to test the miracle of Jesus’ presence by walking on water. From an outside perspective, I could judge the other disciples. Until I realize I would not have stepped out of the boat either, nor do I always find the faith to step out to Jesus on a daily basis. I find a challenge in this that I hope I can draw together. Often I use storm metaphors to convey the daily roller coaster of parenting, and when I read this story last night, I felt conviction in my heart. How often am I in the middle of a storm, and yet I am unwilling to believe in Jesus’ miraculous power to intervene? Why am I so hardened against the belief that in the toughest moment, Jesus could be walking toward me, totally unaffected by my circumstances, totally unfazed, and willing and ready to perform a miracle? On hard days, I get in this zone of always and never, and I say things like, “I will always struggle with my kids,” and “I will never be more patient!” Or “They always react this way” and “they will never change!” The possibility of change in my life and my family’s lives is nonexistent. We are in a vicious cycle, I am out of ideas, and we will never find freedom from this. Like the disciples, I believe more in the impossibility of change than in Jesus’ ability. But the miracle is this: Jesus is always able, and He will never leave me. In the middle of my storms, He is able to reach out and perform the very real miracle of giving me what I need in the moment. This is most often patience and grace, and frequently a divine ability to keep tears inside my eyes. He is willing to perform miraculous works in the hearts of my children, showing them their wrong and teaching them how to be loving, kind, and godly. 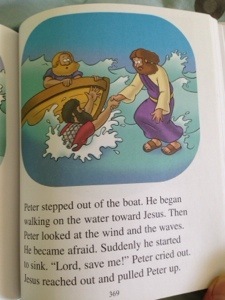 Peter counted the dangers of the storm as less than staying in a boat without his Savior. He would rather have been holding onto Jesus in the middle of the water than riding the waves in the safety of the boat. When will I see trusting Jesus in that moment as more beneficial and effective than clinging to my safety nets, my go-to discipline strategies, my ingrained and inherent reactions? I want to start looking for the miracle of His presence in my everyday instead of being astonished and afraid by it. Let’s stop being like the other disciples and start believing more in Jesus’ ability to work miraculously in our lives instead of in the impossibility of it. Let’s see Him in the middle of our difficulty and hold His ability to work miraculously in our lives as greater than the raging of our storm.